One week into the National Novel Writing Month challenge and I'm thinking about quitting. I need someone out there to tell me to keep going (or to give up). The problem is I'm a quitter. When a hobby or project I'm working on stops being fun, I bail. This isn't always a bad thing. For example, if a show I love watching suddenly becomes so ridiculous *cough* Desperate Housewives *cough* that watching it begins to feel like a chore, I simply stop watching it. I'm not one of those people who has to see it through to the end. I easily cut ties with the characters and move on. And I think this is a good thing because the less time I spend watching television the more time I can spend doing something productive -- like writing a novel. Working on this novel, however, also is suddenly no longer fun and I'm not sure what to do. 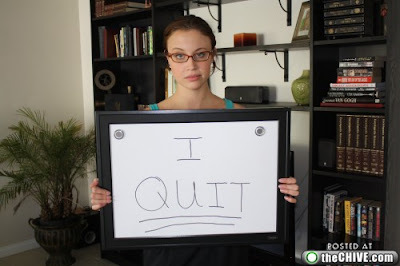 Don't get the wrong impression of me when I say I'm a quitter. I don't take this to extremes. I'm not going to serve my husband with divorce papers after a fight. And don't think I'm lazy. I teach full-time, do freelance reporting part-time, lead a small group for my church, organize a networking group for women writers in my city, exercise regularly (I'm training for a half marathon), and maintain two blogs. I'm also taking a college course online. And so I guess I'm just having trouble finding time to write and when I do sit down to work on a chapter my mind is filled with all the other things I need to be doing instead. So what's a girl to do? Should I throw in the towel and focus on my other writing projects or forge ahead?